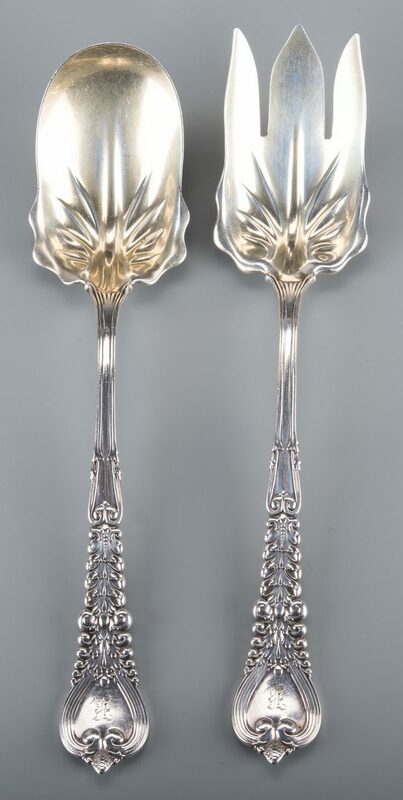 1st and 2nd item: Tiffany & Co. Sterling Silver Salad Serving Fork and Spoon Set in the "Broom Corn" pattern, with gilt washed ends, each 9 1/2"L. Combined weight 8.59 oz troy. 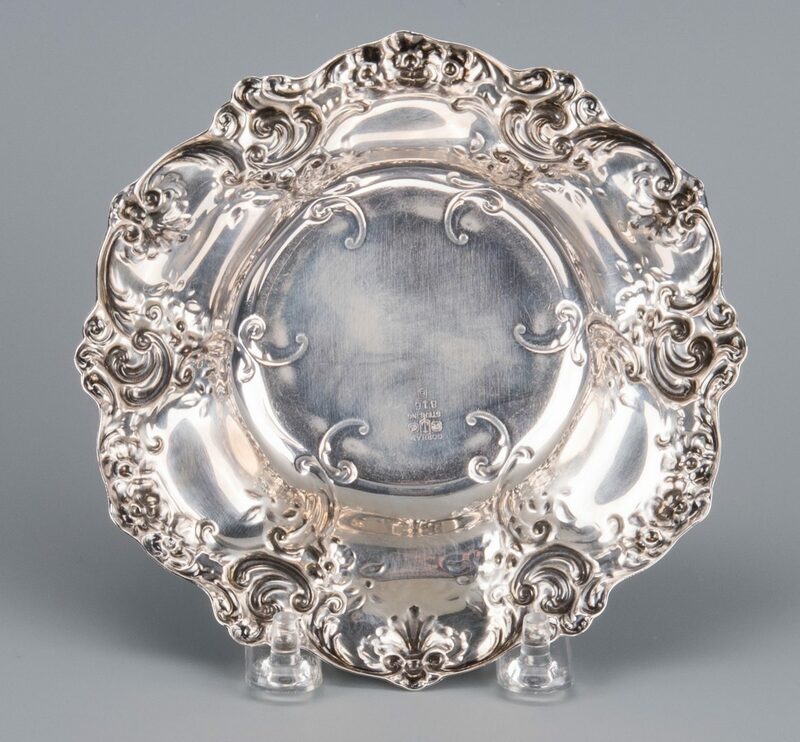 3rd item: Footed bowl with gadrooned and reticulated edges, weighted base, marked Rogers Sterling Weighted. 9" diam. 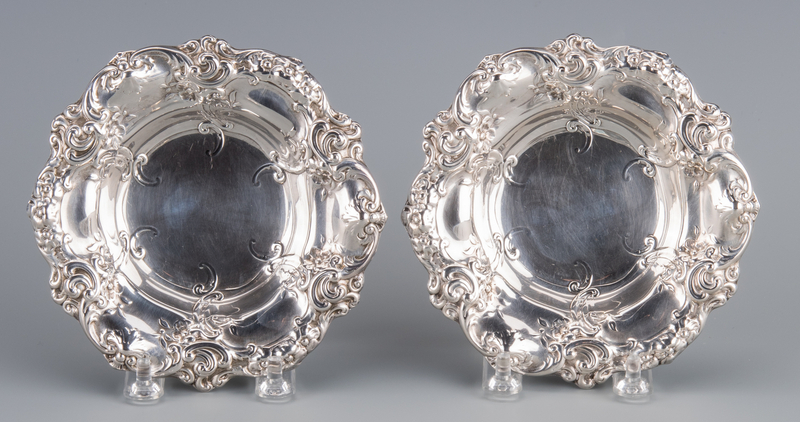 4th and 5th items: Two matching bon bon or nut dishes with Rococo style floral repousse sides, marked Gorham Sterling 816, 5 1/4" diameter. 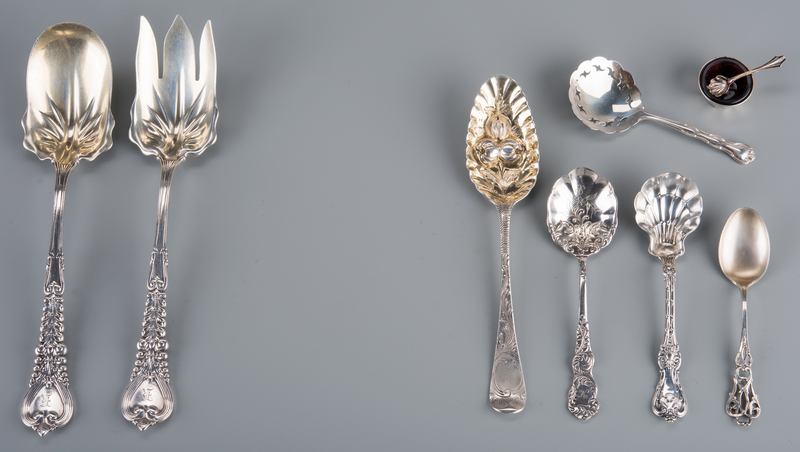 6th item: Faceted salt cellar with amethyst glass liner (having cut star in bottom) and salt spoon, the frame and spoon marked "sterling". 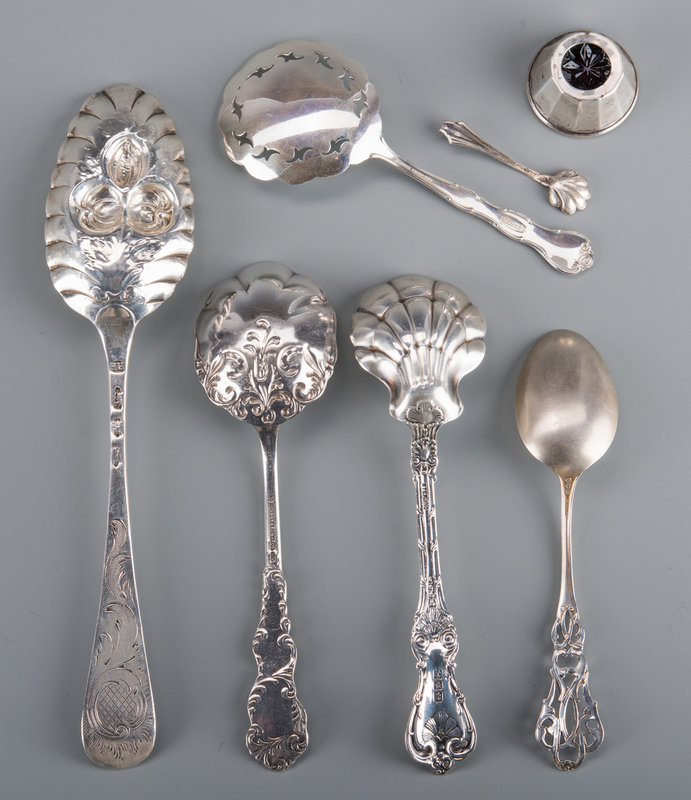 7th item: English sterling silver berry spoon with vermeil repousse fruit and foliate bowl and handle engraved front and back, hallmarked for London, sterling, maker's mark RH (possibly Robert Hennell), reign and date marks rubbed. 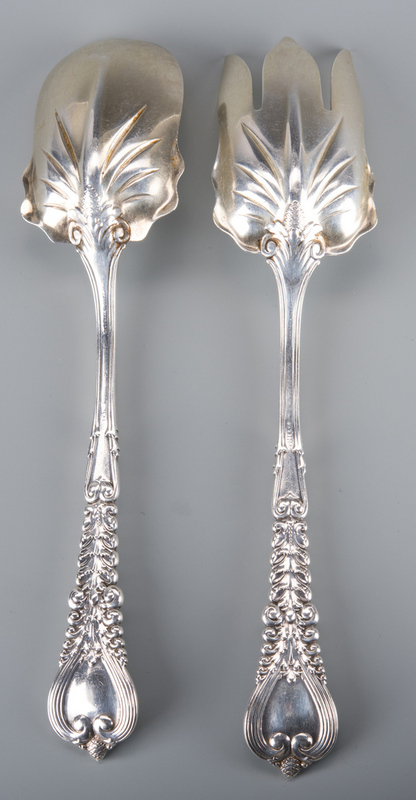 8"L. 18th century. 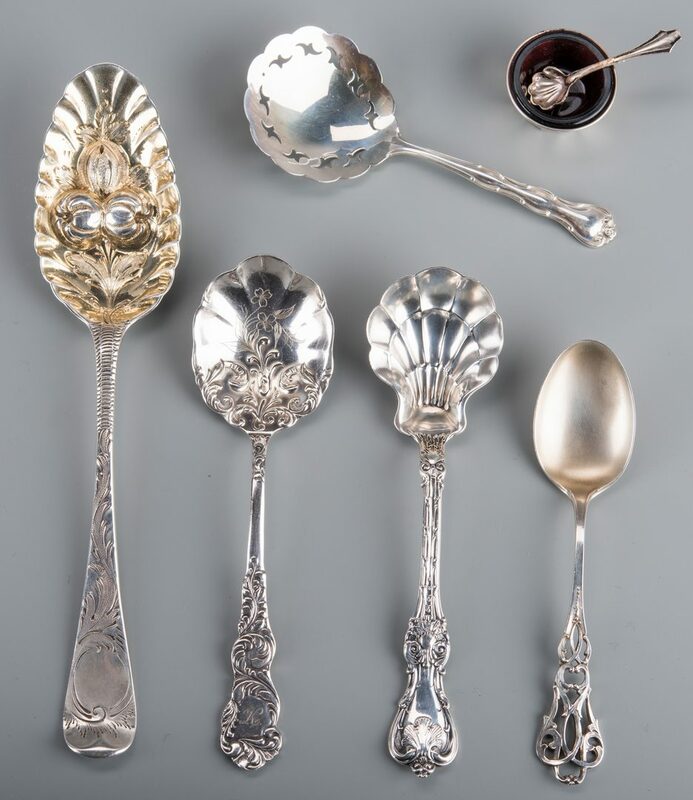 8th-11th items: 1 Sterling sugar shell, 1 Gorham "Rondo" pattern bon bon spoon, 1 Paye and Baker sterling teaspoon with pierced handle, and 1 Holmes and Edwards silverplated bon bon spoon. All items 20th century except where otherwise noted. Combined weighable silver: 18.98 oz troy. CONDITION: Marks are very rubbed on Tiffany set. 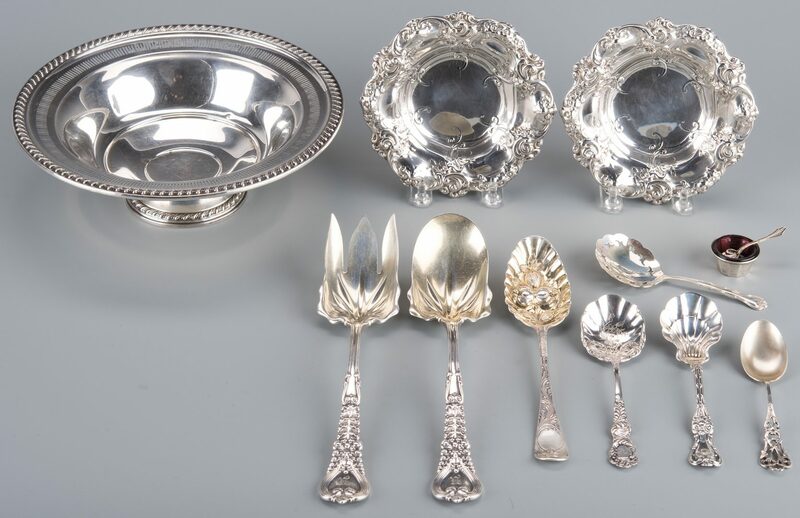 Other items in very good condition.